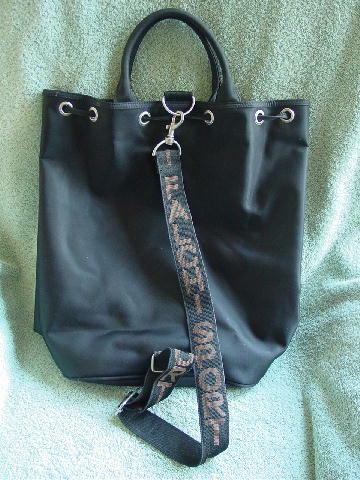 This large black synthetic fabric tall tote has a drawstring top closure and is by Falchi Sport. The back has a 30" long by 1 1/2" wide detachable shoulder strap which has Falchi Sport along the surface, which matches the vertical trim down the front center. 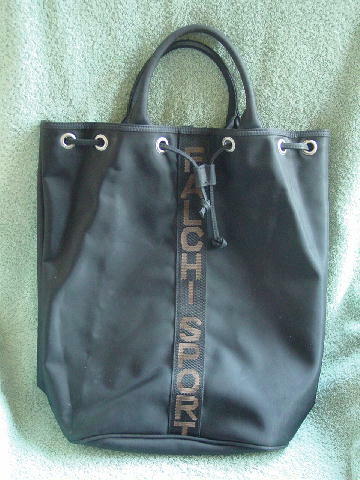 The interior has a black (probably) nylon lining and a red Falchi Sport logo patch. It has two 12 1/2" long padded handles. There are a few grayish marks on the left bottom side.